Let’s say you love Asian home design. There are plenty of places you could turn for design inspiration. 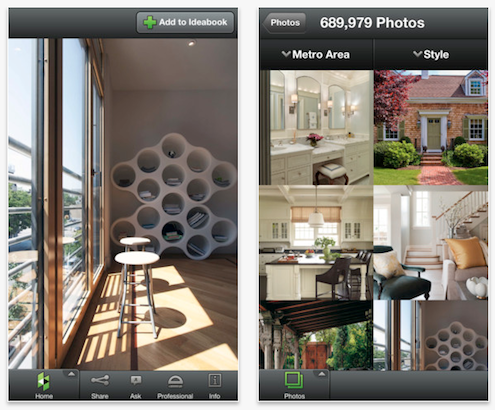 But Houzz.com and its Apple iOS app Houzz Interior Design Ideas may offer you the most impressive selection of eye candy. As of this post, the service boasted 758,561 images for you to sample in planning your home decor. You choose a style, a part of a house, or both, and the app shows you pictures that match your search. Besides the photos, the app has articles that go into detail on room designs, some of which are first-person pieces that manage to be charming without being cloying. A product section all but throws unusual images of innovative goods at you. I saw clever stair lighting, an outrageously inventive clock, and an eco-friendly combination sink and toilet. Along the way, click any image and save it to your “Ideabook” for later reference. Many images in the collection have been uploaded by architects, designers, and contractors, making the app very useful for finding professionals whose work you admire. A site like this could put a lot of glossy home mags out of business. 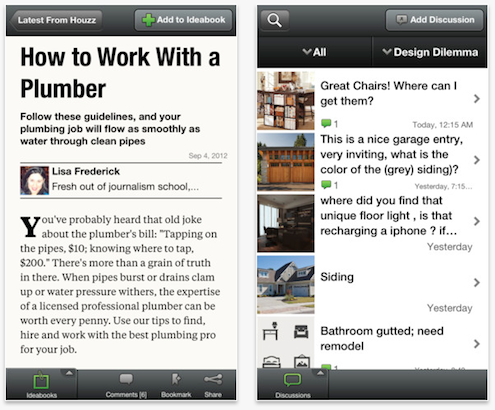 Visit the iTunes store for more info about Houzz Interior Design Ideas.